Mt Vesuvius and Mt Somma loom moodily over the ruins of Pompeii. 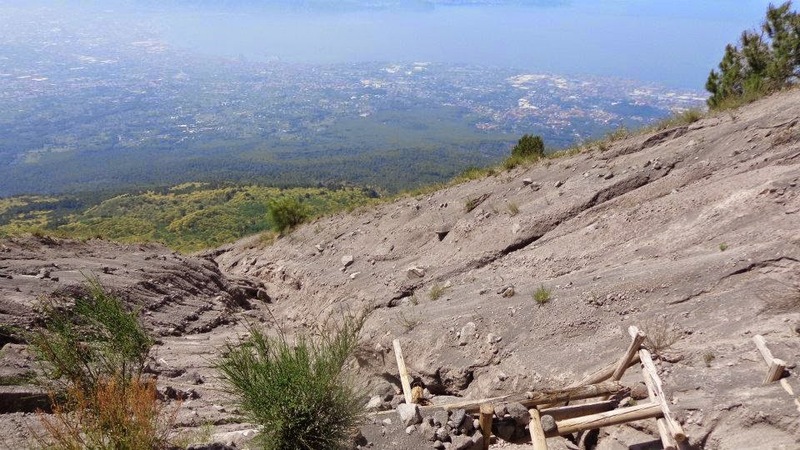 As we ascended the final six hundred meters of Mt Vesuvius, wiping sweat from our faces and praying for a sweet sea-breeze, I felt rather like a Lilliputian tiptoeing over the slumbering form of Gulliver. Please don't wake up, please don't wake up! a running mantra of thoughts in between my panting breaths under the hot Campanian sun. I'd had a fearful fascination of Vesuvius for as long as I could remember. 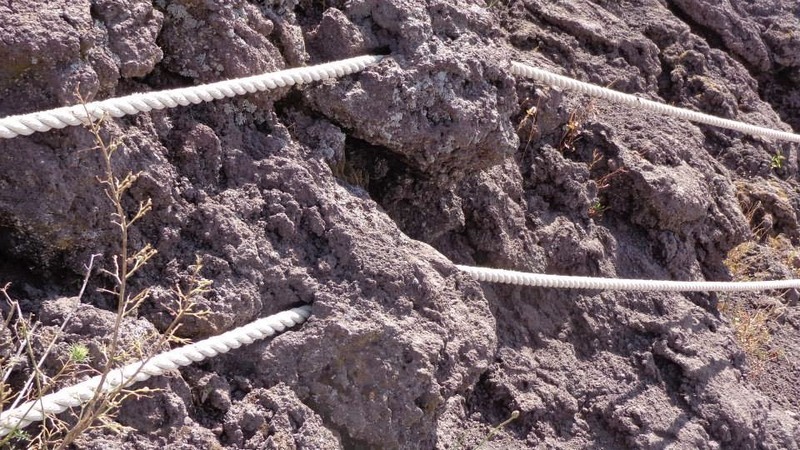 After all, in spite of an army of seismological equipment and venting monitors, no one really knows when Vesuvius will stir again - I just sincerely hoped it wasn't while I was there! On our last day in Pompeii, we decided to squeeze in a quick visit to the volcano before catching the train to Naples and on to Rome. 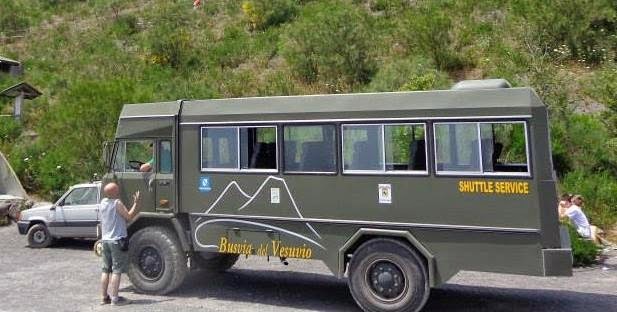 While several tour companies depart from the Pompeii ruins to Mt Vesuvius, we chose Busvia del Vesuvio, intrigued by the all-terrain vehicles pictured on the brochure that would bring us most of the way up the 1,281m (4,203ft) high summit. The brochure promised that in the span of three hours - one hour up, one hour on top, one hour back - we'd receive a brief history lesson of the volcano from a park staff member, stare down the maws of Vesuvius, perhaps see a few wisps of steam, have a stunning view of the Bay of Naples, and finally be deposited safely again at the Pompeii train station. We barely had enough time before catching our trains, but couldn't resist the opportunity. Looking down at the yellow-flowered bushes from the top. The journey up the volcano was uneventful, but full of stunning scenery. The forest floor is blanketed in pine needles, at once both alluring and foreboding. And as the vehicle climbs above the tree line, your eyes are met with yellow-flowered bushes blanketing the mountainside. 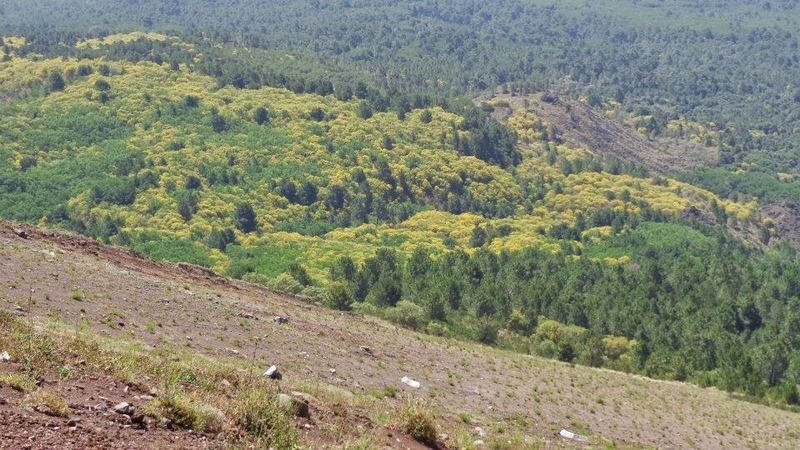 We learned later that these bushes grow only on volcanoes and potentially could've served as a warning to the Pompeiians of their beloved mountain's true nature. After zigzagging our way up the national park's access road, we were deposited roughly 600 meters from the top and warned that we had 50 minutes before the truck would return to take us down the mountain. "Be on time!" the driver warned in heavily-accented English as we got out. It was ridiculously hot outside, and I was glad we'd thought to bring water with us, although we had forgotten the sunscreen! Heat and humidity notwithstanding, we eagerly set up the dusty trail to the top, passing and being passed by others along the way. 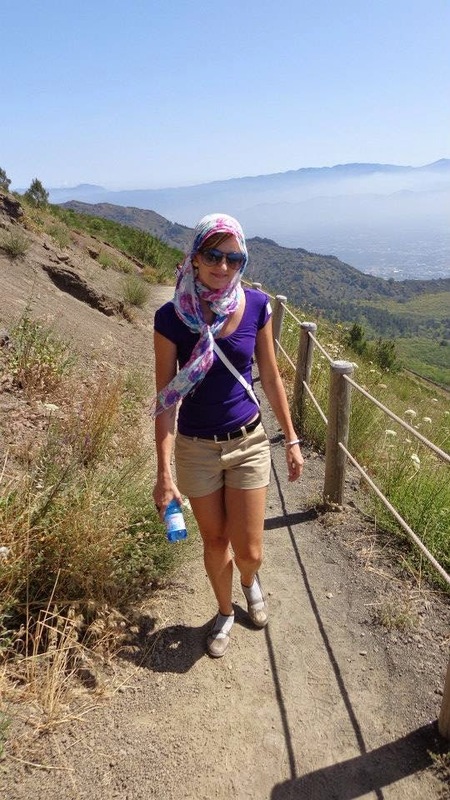 The trail afforded stunning views of the Bay of Naples, Pompeii, and even Sorrento far off in the distance, but our primary focus was on reaching the crater. After laboring upwards for 15 minutes, we reached the park ranger station and finally - the mouth of Vesuvius! Below and at the base of the mountain (on the left-hand side of the picture) are the ruins of Pompeii. Herculaneum is just barely beyond the picture to the right-hand side along the coast, and the point jutting out near the top of the picture is Sorrento. While in Pompeii I couldn't shake the menacing shadow of Vesuvius, but from the top of the volcano looking down into the crater, it all looked so... ordinary. Just a depression, albeit quite large, on the top of a dusty old mountain. It wasn't anticlimactic, though. If anything, the commonplace appearance made Vesuvius seem all the more dangerous. While Mt Etna in Sicily is unmistakably volcanic, putting on regular Strombolian eruptions (i.e., lots of lava! ), Vesuvius is the silent type that erupts rarely. By the time the Pompeiians realized that Vesuvius was a volcano, it was too late for many people. 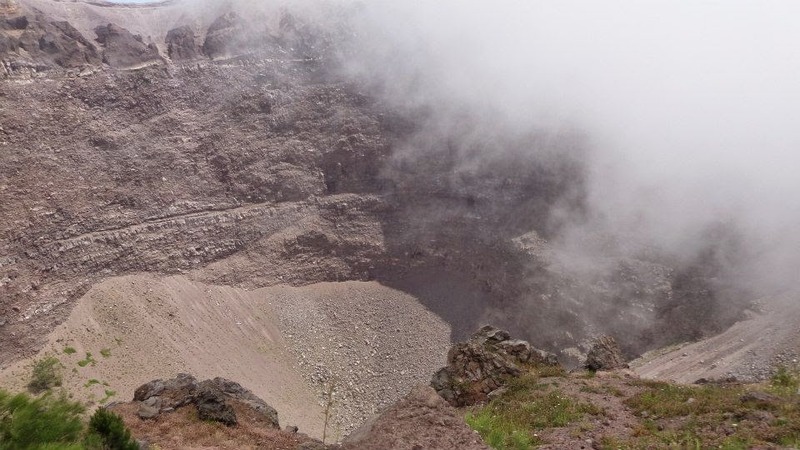 In fact, other than a few wisps of steam rising lazily from the side of the crater, you could fool yourself into thinking that Vesuvius really isn't a sleeping giant. 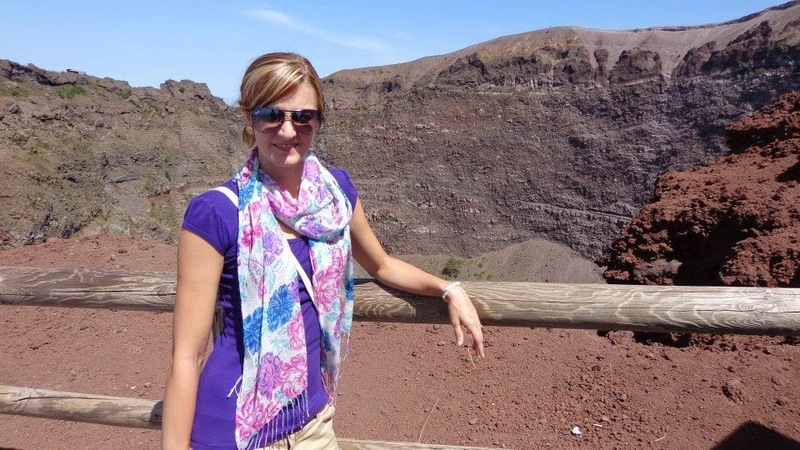 An English-speaking park staff member gave a short history lesson on Vesuvius. 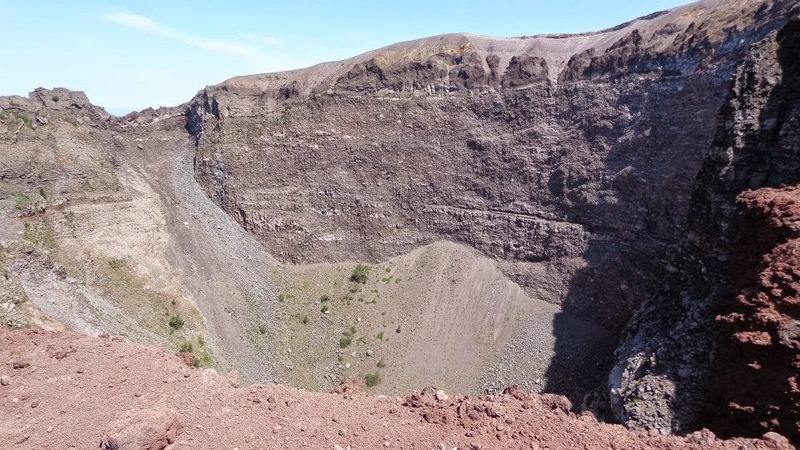 Apparently, the current crater known as Vesuvius was not the volcano that destroyed Pompeii. 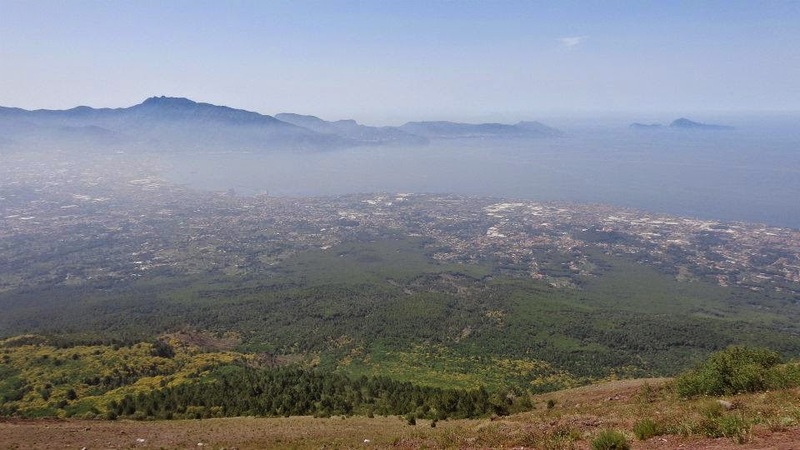 Technically, the volcanic chamber that roared awake in 79AD is known today as Mt Somma, which embraces the north and north-east side of the current Vesuvius and is only 1,132 meters tall (you can see the peak of Mt Somma on the right-hand side of this post's first picture). The force of the eruption that destroyed Pompeii was so great that the mountain collapsed into itself and the modern day Vesuvius grew out of the collapsed caldera of Somma. He also reminded us that Vesuvius erupted in 1906 (killing 100 people) and in 1944. "There are currently almost one million people living in the shadow of Vesuvio," the park employee said. "One day she will wake again, and everyone will need to evacuate." I can't even fathom how such a large-scale evacuation could take place swiftly and efficiently (especially when I have such a dubious opinion regarding the efficiency of Italians in the first place!). And why would anyone want to live so close to an active volcano anyway? As if reading my thoughts, a private tour guide nearby told her group, "When people ask 'why do you live so close to a volcano?' the response is always 'why not?'" I could only smile and shake my head at her words! Sea-mist creeping in over Pompeii and clouding views of Sorrento. Making clever use of the surroundings for safety's sake. It was eery how the clouds crept up the mountain and then down into the crater. "Smile! You're standing on top of a ticking time bomb!" Fifteen minutes before the bus driver told us he would return, we began to make our way down the crater, pausing to collect a few volcanic souvenirs along the way. We arrived at the parking lot on time; unfortunately, the driver did not. We waited forty minutes in the hot sun for his return, then waited another forty minutes at the bottom of the mountain for a different driver to bring us back to Pompeii. If you're on a strict time schedule, budget at least 4-5 hours for the whole experience and not the 3 hours that the brochure promises! 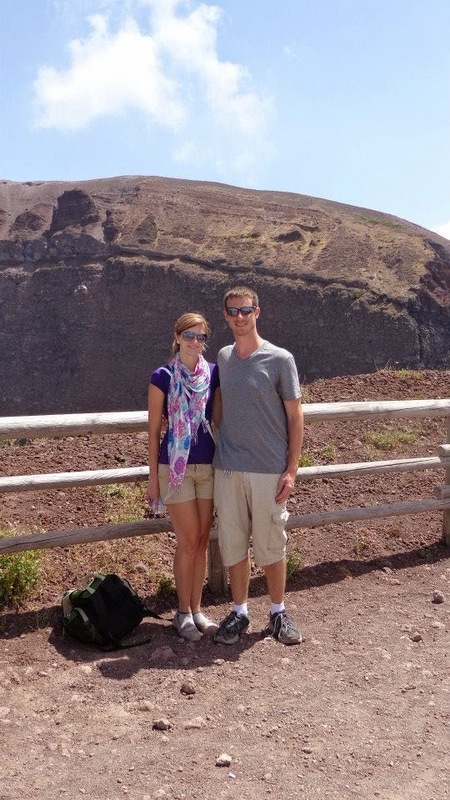 We made it back in time to catch our trains, but we certainly stressed ourselves out on the top of Vesuvius and then again at the bottom while waiting on transportation. If you are looking for a more strenuous adventure, it is possible to climb from the national park entrance all the way up to the crater. I'd guess that it would take at least four hours from start to finish (and that may be a low estimate!). 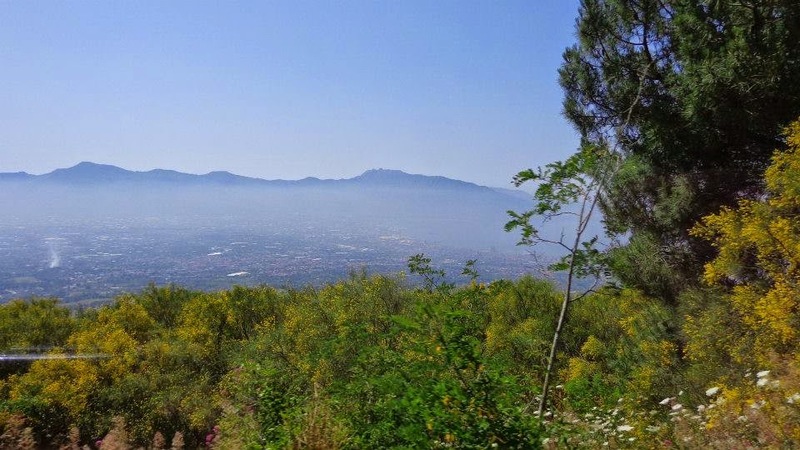 There are also numerous hiking trails through the park if you want to spend even more time on Vesuvius or to go explore a little bit of Mt Somma. Have you visited Mt Vesuvius? What did you think? Cost: 22€ a person. This includes the entrance fee to the National Park itself and the Busvio del Vesuvio 4x4 vehicle drive to the summit from the entrance. 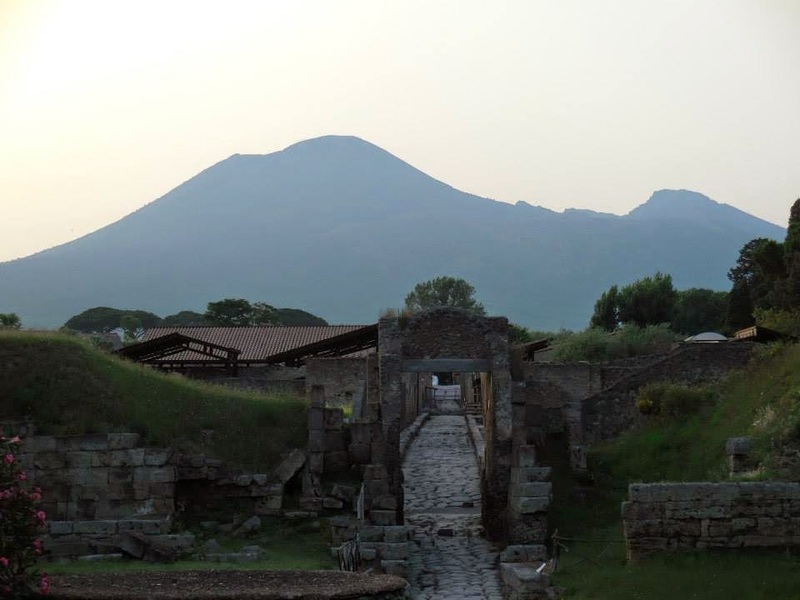 The company provides free shuttle service from Pompeii to the National Park entrance. Time Needed: A minimum of 3 hours, but I'd recommend budgeting 5 hours for delays. Accessibility: From Naples, take the Circumvesuviana line towards Sorrento. Exit at the Pompeii Scavi - Villa dei Misteri stop. The free shuttle bus services meet right in front of the train station next to the walls that surround the ruins. Tips: Wear comfortable walking shoes and bring water, sunscreen, and a hat if visiting during the summer. It was very hot at the summit until cloud cover alleviated some of the heat. 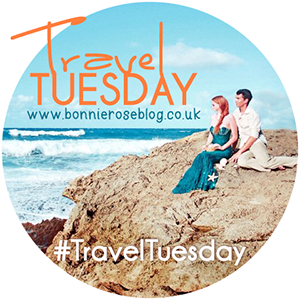 Linking up with Bonnie Rose & other bloggers for #TravelTuesday! Always fascinating posts about Italy! It must be crazy to hike up a volcano and to think that people live there as well! My grandmother lived really close to an active volcano in South America and every once in a while they needed to evacuate but things are mostly okay. The view from the top is absolutely breathtaking! Looks gorgeous! Great post! I wanted to climb Vesuvius when I visited Naples last year but we didn't quite have enough time - good to know what I am in for when I return. We were lucky to arrive when we did. The clouds rolled in from the sea and then you couldn't see anything, but it made for a sweet but eery effect up top.